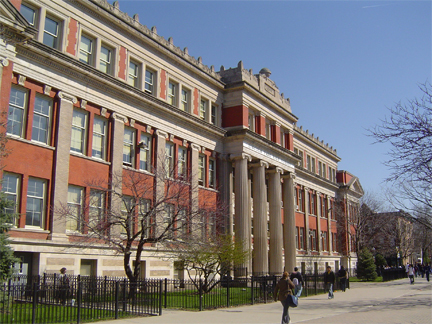 In an effort to improve learning environments, Chicago Public Schools announced last week a proposal that will expand and relocate schools that currently share the same facilities, including those in the North Lawndale neighborhood. “While much work remains to engage the community around these proposals, I believe they will allow the District to expand access to high-quality programs and improve current school conditions to help us reach our goal of graduating all CPS students 100-percent college-ready and 100- percent college-bound,” CPS CEO Barbara Byrd-Bennett said in a statement. Frazier Prospective International Magnet (Frazier IB) and Frazier Preparatory Academy are currently located at 4027 W. Grenshaw at Roosevelt and Pulaski. CPS proposes that Frazier IB remain at Grenshaw site, while Frazier Prep would move and share space with Herzl Elementary at either its 3711 W. Douglas Blvd site or at Herzl’s Child Parent Center at 1401 S. Hamlin. CPS estimates that these re-locations will increase enrollment and class size at both schools. Frazier IB would be able to enroll an additional 250 more students in the first year, with increased enrollment in subsequent years. Frazier Prep would also be able to serve an additional 250 students at Herzl and a projected 930 students in the future. Frazier Prep would also be able to utilize the new location’s amenities, including more classroom space, a gymnasium, cafeteria, and science lab. CPS also plans to invest in both Frazier Prep and Herzl by making them ADA accessible, adding a computer lab, installing a new intercom system and adding a recreational space to Herzl’s Child Parent Center. CPS developed this proposal through its Educational Facilities Master Plan (EFMP), a ten-year outline of the school district’s planned facilities investments. In addition to Frazier IB and Frazier Prep, CPS plans to also relocate Urban Preparatory-Bronzeville at 2710 S. Dearborn to the Doolittle West building at 521 E. 35th St. These proposals are not finalized, and the District will be planning community meetings and public hearings in regards to these potential site relocations in January. The current schedule of community meetings and public hearings for the Frazier Prep Relocation is as follows: Tuesday, Jan. 7, 6:30 to 8:30 P.M. at Manley High School, Tuesday Jan. 14, 6:30 to 8:30 P.M. at Manley High School, and Thursday, Jan. 23, 8:00 to 10:00 P.M. at the CPS Central Office.